"Kilo Class" redirects here. For the novel by Patrick Robinson, see Kilo Class (novel). Russian Black Sea Fleet's B-265 Krasnodar Improved Kilo-class submarine on the eve of Submariner Day. The Kilo class is the NATO reporting name for a naval diesel-electric attack submarine that is made in Russia. The original version of the vessels were designated Project 877 Paltus (Halibut) in the Soviet Union. There is also a more advanced version, designated as Improved Kilo-class submarine in the West, and Project 636 Varshavyanka in Russia. These attack submarines are mainly intended for anti-shipping and anti-submarine operations in relatively shallow waters. Original Project 877 boats are equipped with Rubikon MGK-400 sonar system (with NATO reporting name Shark Gill), which includes a mine detection and avoidance sonar MG-519 Arfa (with NATO reporting name Mouse Roar). Newer Project 636 boats are equipped with improved MGK-400EM, with MG-519 Arfa also upgraded to MG-519EM. The improved sonar systems have reduced the number of operators needed by sharing the same console via automation. Anechoic tiles are fitted on casings and fins to absorb the sound waves of active sonar, which results in a reduction and distortion of the return signal. These tiles also help attenuate sounds that are emitted from the submarine, thus reducing the range at which the sub may be detected by passive sonar. The Kilo class was to have been succeeded by the Lada class. In November 2011, the Russian Navy announced that the Lada class will not enter service because trials with the lead boat of the new class, Sankt Peterburg (B-585) had shown major deficiencies. Construction of two further boats was suspended. On 27 July 2012, the Russian Navy commander-in-chief announced that construction of the Lada-class submarines will resume, having undergone design changes. One Kilo-class submarine, B-871, was equipped with pump-jet propulsion. The version Kilo 636MV (exported to Vietnam) contains a GE2-01 radar and an improved MGK 400E sonar. In this version, the submarine is also able to operate in more weather conditions than the original Kilo-class submarines. Algeria: 4 Original Kilo (Project 877), 4 Improved Kilo (Project 636). People's Republic of China: 2 Original Kilo (Project 877), 10 Improved Kilo (Project 636). Poland: 1 Original Kilo (Project 877) – ORP Orzeł. Iran: 3 Original Kilo (Project 877). Romania: 1 Original Kilo (Project 877) – Romanian submarine Delfinul. Russia: 22 Original Kilo (Project 877), 6 Improved Kilo (Project 636.3) and additional 6 Improved Kilo on order (636.3) for Pacific fleet to be delivered 2019–2021. Vietnam: 6 Improved Kilo (Project 636). Includes Vietnamese submarine Hồ Chí Minh City. The Philippine Navy has shown its interest on the Kilo-class submarine as part of its modernization program. Defense Secretary Delfin Lorenzana said that the country is now evaluating the Russian offer. Several sources reports the usage of a submarine of this class to introduce russian soldiers in Venezuela to help the protection of Nicolás Maduro Moros regime. There are several variants of the Kilo class. The information below is the smallest and largest number from the available information for all three variants of the ship. A Chinese Kilo-class submarine being delivered from Russia as deck cargo in 1995. The Iranian Kilo-class submarine Yunes, during delivery in 1995. Russia B-459 Vladikavkaz Nizhniy Novgorod 877 25 February 1988 29 April 1990 30 September 1990 NF refitted in 2011-2015, active, entered Baltic Sea 03.07.2018 to take part in Main Naval Parade in St Petersburg on 29 July. India S63 Sindhurakshak Saint Petersburg 877EKM 16 February 1995 26 June 1997 2 October 1997 On 29 January 2013, the Sindhurakshak began shipment to India from Severodvinsk, Russia after repairs. On 14 August 2013, there was an explosion and fire on the Sindhurakshak suspected to have occurred from the munitions onboard - killing 3 officers and 15 sailors at the Indian Navy's Dockyard at Mumbai Port. The submarine is reported to have been completely destroyed. ^ Anechoic tiles are fitted on casings and fins to absorb the sonar sound waves of active sonar, which results in a reduction and distortion of the return signal. ^ "ВМФ отказался от новейших подлодок проекта "Лада"". Izvestia. 23 November 2011. 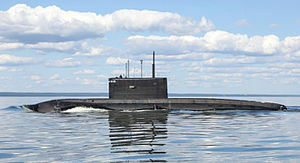 ^ "Russia to Resume Construction of Diesel Subs". en.rian.ru. ^ "Russian submarine towed to port after engine malfunction | Defense | RIA Novosti". En.rian.ru. 2009-11-23. Retrieved 2014-03-08. ^ "Kilo Class Submarine "ALROSA" :: Black Sea Fleet, Russian Federation". Alrosa.net. Archived from the original on 2012-07-28. Retrieved 2014-03-08. ^ "877 / 636 Kylo class | Russian Military Analysis". Warfare.ru. Retrieved 28 September 2011. ^ "Algeria – Navy". Country-data.com. Retrieved 28 September 2011. 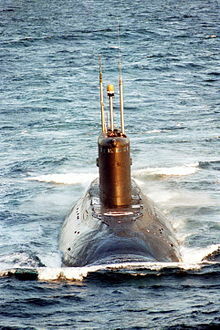 ^ "Algeria looking to procure two additional Improved Kilo Project 636M Diesel Submarines from Russia". Navyrecognition.com. 2012-09-24. Retrieved 2014-03-08. ^ Алжир может закупить российские подводные лодки | Еженедельник "Военно-промышленный курьер" (in Russian). Vpk-news.ru. Retrieved 2014-03-08. ^ "Наука и техника: Алжир докупит у России две "Варшавянки"". Lenta.ru. Retrieved 2014-03-08. ^ "PDF file" (PDF). Retrieved 2014-03-08. ^ "Алжир заказал Рособоронэкспорту две подводные лодки". KM.RU. 2012-09-19. Retrieved 2014-03-08. 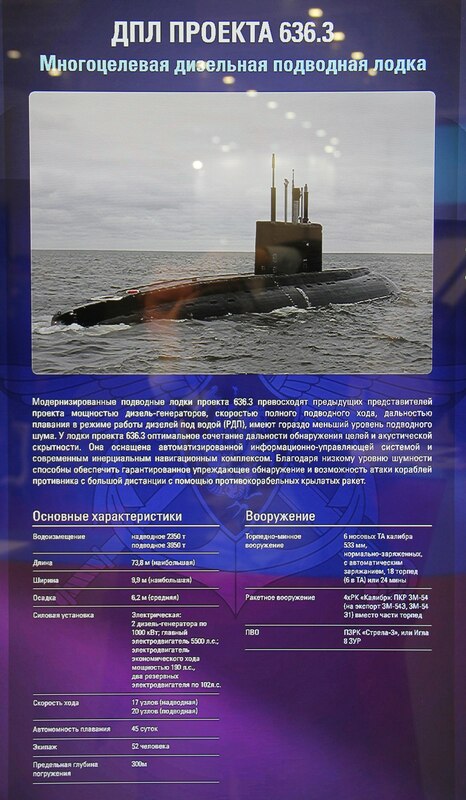 ^ "Kilo Class (Project 636/877EKM) Diesel-Electric Submarine". SinoDefence.com. 23 February 2009. Archived from the original on 23 February 2007. Retrieved 28 September 2011. ^ a b "SSK Kilo Class (Type 877EKM) Attack Submarine". Naval Technology. Retrieved 28 September 2011. ^ John Pike. "Kilo-class submarine – People's Liberation Army Navy". Globalsecurity.org. Retrieved 28 September 2011. ^ a b "Kilo Class – Project 636". Fas.org. Retrieved 28 September 2011. ^ "Polish Navy" (in Polish). Navy.mw.mil.pl. Archived from the original on 20 January 2018. Retrieved 28 September 2011. ^ "Russian Navy commissions sixth Project 636.3 Varshavyanka-class submarine". Navaltoday.com. 2016-11-24. ^ "Russian Navy Orders 6 Project 636.3 Improved Kilo SSK to Boost Pacific Fleet Submarine Force". navyrecognition.com. 2016-01-20. ^ "Названы сроки постройки серии дизельных подлодок для Тихоокеанского флота". lenta.ru. 2016-09-02. ^ "Russia's Admiralty to Deliver Six Stealth Subs to Pacific Fleet by 2021". sputniknews.com. ^ "Russia dominates Asian market with 28 diesel subs". Rusnavy.com. 15 December 2009. Retrieved 28 September 2011. ^ "Vietnam receives first Russian-made submarine". xinhuanet.com. 2 January 2014. Retrieved 4 January 2014. ^ "Last Kilo submarine arrives at Cam Ranh Port". Voice of Vietnam. 2017-01-21. ^ "Venezuela acquiring Russian submarines". UPI.com. 10 August 2010. Retrieved 28 September 2011. ^ Coates, Peter (27 January 2017). "Submarine Matters: Philippines may buy Russian subs and Thais buying Chinese". ^ "DEFENSE STUDIES: DND Evaluating Russian Offer of Diesel-Electric Submarines". ^ "Russian Minister of Defence General of the Army Sergei Shoigu holds teleconference with leadership of Armed Forces : Ministry of Defence of the Russian Federation". eng.mil.ru. ^ "Iran relaunches Russian-made submarine". Fox News. 2012-05-29. Retrieved 2014-03-08. ^ 29 Май 2012. "Иран вернул на флот подводную лодку российской постройки". Flot.com. Retrieved 2014-03-08. ^ "Russian Kilo-class submarine rejoins navy after 14 years of repairs". Navaltoday.com. 2017-01-27. ^ "Иранские подводные лодки отправятся в 90-дневный поход". Flot.com. Retrieved 28 September 2011. ^ "BBC News - Indian submarine hit by explosion at Mumbai port". Bbc.co.uk. 2013-08-14. Retrieved 2014-03-08. ^ 28 Авг 2012. "Головная подводная лодка для ВМС Вьетнама спущена на воду". Flotprom.ru. Retrieved 2014-03-08. ^ "First Type 636 diesel submarine (SSK) ordered by Vietnam arrived at Cam Ranh base". 2 January 2014. ^ "Vietnam Navy receives 2 Russia-made project 636 Kilo class diesel electric submarines". 6 April 2014. ^ "Vietnam received the second project 636 submarine". 20 March 2014. ^ "Ho Chi Minh City submarine arrived in Cam Ranh". 20 March 2014. Archived from the original on 7 August 2014. Retrieved 22 March 2014. ^ Россия поставит Вьетнаму 2 подводные лодки до конца года | Еженедельник "Военно-промышленный курьер" (in Russian). Vpk-news.ru. Retrieved 2014-03-08. ^ "Vietnam Navy has taken delivery of 3rd Kilo-class submarine HQ 184 Hải Phòng". Archived from the original on 10 December 2014. Retrieved 10 December 2014. ^ "HQ-184 Haiphong Submarine on the Way to Vietnam". 17 December 2014. ^ "The fourth submarine for the Vietnam People's Navy will be launched on March 28th". 22 March 2014. ^ "Tàu ngầm Kilo 185 tiến vào quân cảng Cam Ranh". VNEXPRESS TIN NHANH VIETNAM. Retrieved 2 July 2015. ^ "Cá quả mang tên Đà Nẵng (SSK-186) đã về nhà". Đơn vị tác chiến điện tử (Comrade Commissar). Retrieved 3 February 2016. ^ "Russia Laid Down the 6th and last Kilo-Class Diesel Electric Submarine for Vietnam". 3 June 2014. ^ "Last Two of Six Russia-Built Project 636.1 Submarines Commissioned with Vietnamese Navy". ^ a b "Algeria commissions two Kilo class submarines". DefenceWeb. 10 January 2019. Retrieved 10 January 2019. ^ "Submarine Novorossiysk has been laid down at Admiralteyskie Verfi". Rusnavy.com. 20 August 2010. Retrieved 28 September 2011. ^ "На ОАО «Адмиралтейские верфи» Спущена На Воду Головная Подводная Лодка Серии Для Вмф Рф" (Press release) (in Russian). Admiralty Shipyard. 28 November 2013. Retrieved 28 November 2013. ^ "Госкомиссия приняла подлодку "Новороссийск"". flotprom.ru. ^ "Russia's first Varshavyanka-class submarine "Novorossiisk" joined Black Sea Fleet". 18 September 2014. ^ 21 Ноя 2011. "Подводная лодка "Ростов-на-Дону" заложена на Адмиралтейских верфях". Flot.com. Retrieved 2014-03-08. ^ "На ОАО «Адмиралтейские верфи» Спущена На Воду Подводная Лодка Для Вмф Рф" (Press release) (in Russian). Admiralty Shipyard. 26 June 2014. Retrieved 26 June 2014. ^ 15 Май 2012. "НАПЛ "Санкт-Петербург" выходит из ремонта". Flotprom.ru. Retrieved 2014-03-08. ^ 15 Авг 2012. "Подводная лодка "Старый Оскол" для Черноморского флота будет заложена на Адмиралтейских верфях 17 августа". Flotprom.ru. Retrieved 2014-03-08. ^ "На ОАО «Адмиралтейские верфи» Спущена На Воду Подводная Лодка Проекта 636.3 «Старый Оскол»" (Press release) (in Russian). Admiralty Shipyard. 28 August 2014. Retrieved 28 August 2014. ^ "На ОАО «Адмиралтейские верфи» Заложили Четвертую Подводную Лодку Проекта 636.3 В Серии Для Вмф Рф" (Press release) (in Russian). Admiralty Shipyard. 20 February 2014. Retrieved 20 February 2014. ^ "ОАО «Адмиралтейские верфи» Спустило На Воду Первую В Серии Подводную Лодку «Краснодар»" (Press release) (in Russian). Admiralty Shipyard. 25 April 2015. Retrieved 25 April 2015. ^ a b "ОАО «Адмиралтейские верфи» Заложило Две Большие Дизель-Электрические Подводные Лодки «Великий Новгород» и «Колпино»" (Press release) (in Russian). Admiralty Shipyard. 28 July 2017. Retrieved 28 July 2017. ^ "АО «Адмиралтейские верфи» Спустило На Воду Подводную Лодку «Великий Новгород»" (Press release) (in Russian). Admiralty Shipyard. 28 March 2019. Retrieved 28 March 2019. ^ "Fifth Varshavyanka submarine joins Russia's Navy". TASS. 26 October 2016. Retrieved 26 October 2016. ^ "АО «Адмиралтейские верфи» Спустило На Воду Подводную Лодку «Колпино»" (Press release) (in Russian). Admiralty Shipyard. 31 May 2016. Retrieved 31 May 2016. ^ a b "АО «Адмиралтейские Верфи» Заложило Подводные Лодки «Петропавловск-Камчатский» И «Волхов»" (Press release) (in Russian). Admiralty Shipyard. 28 July 2017. Retrieved 28 July 2017. ^ "АО «Адмиралтейские Верфи» Спустило На Воду Первую В Серии Подводную Лодку Для Тихоокеанского Флота" (Press release) (in Russian). Admiralty Shipyard. 28 March 2019. Retrieved 28 March 2019. ^ "Shipbuilders to deliver 2 noiseless submarines to Russia's Pacific Fleet in 2020". Wikimedia Commons has media related to Kilo class submarines. "Kilo class – Project 636". GlobalSecurity.org. Retrieved 24 February 2007. "China Defence Today – Kilo Class Diesel-Electric Submarine". SinoDefence.com. Archived from the original on 23 February 2007. Retrieved 24 February 2007. "Серия 877 Варшавянка". Encyclopedia of Ships (Russian language). Retrieved 24 February 2007. "Rubin". Rubin. Retrieved 24 February 2007. "Kilo Class "Alrosa" Photoalbum: 100 Photos". Russian Black Sea Fleet. Archived from the original on 9 December 2012. Retrieved 5 October 2007.